Kirk, Knight of Thorns is a black phantom NPC that invades three times throughout the game at different instances. 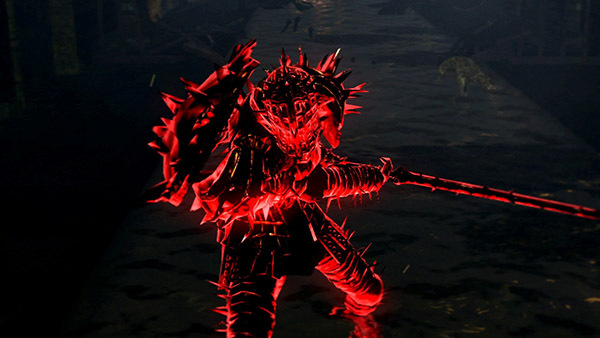 By killing him all three times, you are able to obtain his armor, the Set of Thorns. He will invade your game at all of the three places, regardless of whether you defeated or were invaded by him previously. Even though he's described as a Darkwraith, Kirk is actually a Chaos Servant1, invading others to collect Humanity for The Fair Lady. Once you have reached the bottom of the sewers from the water fall drop you will see him invade. This should be directly next to the basilisk area. You will find him after defeating the Ceaseless Discharge. Make your way to the now cooled lava ground, continue to the next area. You will go down some stairs on the side of a cliff and as you do this he will invade. Note that he only spawns after you put the Lordvessel on the Firelink Altar (the orange light barrier already gone allowing you to fight Demon Firesage). You will find him just outside the doorway to the Bed of Chaos boss, where you fight the Daughter of Chaos. Unlike other Black Phantoms, his weapons do not have 100% drop rate. If Kirk falls off a ledge, once the loot appears, just quit and reload your game and the loot will be where Kirk was last standing before falling off. 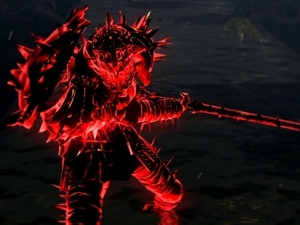 Once defeated in ALL THREE locations, his corpse (containing Set of Thorns) can be found in the back of the Daughter of Chaos bonfire chamber in Quelaag's Domain. 1. According to the director's radio interview, line 57.